The Perfect Putting Grip and Putting Myths That Will Change Your Perspective. 648: Pat O’Brien, putting coach to Zach Johnson, Payne Stewart, KJ Choi, Stewart Cink, Vaughn Taylor, and Kelly Craft returns for part two of our conversation on putting. This time we dig into Pat’s instruction on how to have the perfect putting grip by getting the club into your fingers, not your palms. And there are a number of putting myths that so many of us believe to be true, but are not really aware of how they can be leading to extra strokes. After watching round 3 of the Open Championship at Carnoustie this year, we were witness to some amazing putting prowess by Zach Johnson. So we invited CEO of SeeMore putters, Jim Grundberg, to return to share what it felt like to see Zach shine with his SeeMore putter. WIN! WIN! WIN!! Starting this week and running through the end of 2018, we’re going to do a random drawing and give away a prize each week to a lucky Golf Smarter listener. Prizes include free online lessons from some of your favorite Golf Smarter instructors, a SeeMore putter, a High Heat 257+ Fairway Metal, books, DVDs, and more. 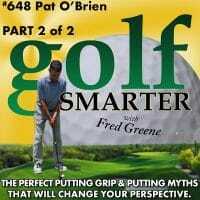 Go to https://golfsmarter.com/giveaway or click on the “Enter Here” banner on the top of GolfSmarter.com and enter and win. Once you register, you’re eligible for every prize, every week. Deadline for that week’s entry is Midnight PT/3aET each Sunday. The winner will be announced by random drawing at the end of each new episode. Some restrictions apply, see details on our website. Previous articleWith Students Like Payne Stewart, Zach Johnson, KJ Choi, & Stewart Cink, You Can be Confident that Pat O’Brien Knows Putting!